DMG Australia has released OMAT's adaptive control technology for MillPlus IT and iTNC 530 and with additional hardware for Siemens 840d. OMAT’s Adaptive Control System monitors actual cutting conditions in real-time and automatically adjust the feed rate to its highest feasible level during each operation. The system ensures users are not restricted to pre-programmed feed rate. This results in the reduction of cutting cycle times while protecting tools from breakage. During overload conditions for example, on initial tool/workpiece impact or in the event of sudden, excessive increases in the stock removal, the feed rate is automatically reduced to an acceptable level, determined by the internal expert system. After the extreme condition passes, the system increases the feed rate to its maximum feasible level. The system detects conditions where the maximum permissible spindle load is approached, and stops the machine to prevent spindle and machine damage, while at the same time issuing an alarm to alert the operator. The system can learn to monitor production run tool wear while cutting the first workpiece. During subsequent machining, the system continuously monitors cutting tool status and displays tool wear as a percentage of maximum permissible wear. At the end of the job, the system alerts the operator to change the tool for maximum tool utilisation. While cutting the first workpiece, the system can also learn to detect possible production run tool breakage. If the tool breaks during the machining of subsequent workpieces, the system immediately stops the machine and issues a "tool breakage" alarm. The system senses when the actual tool load reaches the maximum permissible level and responds with an overload status report. The system also decreases the feed rate under excessive load conditions, and in doing so, reduces tool wear in many applications and thus extends tool life. The system continuously displays actual power and feed rate variations in graphic and digital formats. Tool performance data is recorded and displayed for all tools used during cutting under the system’s control. This data includes cutting time with and without the system, tool wear and the minimum feed rate override that was measured during cutting operations. 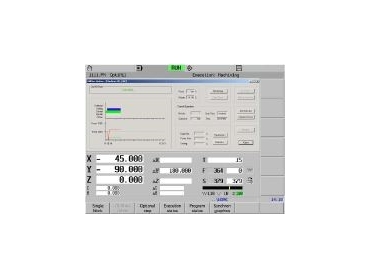 Operators using the system can select whether to perform full optimisation (real time feed adjustment), monitoring (providing just protection) or only event logging for later analysis on a PC. For each cutting operation the tool and workpiece material are selected from the system's library and the cutting parameters are entered. OMAT Adaptive Controllers are designed to perform automatic feed rate adjustments for all milling/drilling applications on virtually all workpiece materials. The system can be used for milling and drilling of forgings, iron castings, titanium, steel and stainless steel jobs and machining large billets of titanium, aluminium or other materials with many pockets and considerable material removal from solids rather than fabrication or casting. Other applications include milling and drilling jobs in which the raw material varies from job to job, die, mould and tool making as well as drilling.